Keep a Food Diary.... Keep a Check! • Enter/write every food that you eat and/or drink in the log. • Do it as and when you consume the foods, so that you don't forget to enter any food. • Specify the quantity of food you have consumed. • Mention the time of every meal. • Mention if the food was home cooked or from restaurants. • Mention the time and duration of your exercise too in the log. • Make a note of the amount of water you have consumed throughout the day. • Even chocolates and candies that you have nibbled on should be entered in the log. • Go through the previous day's log every morning! 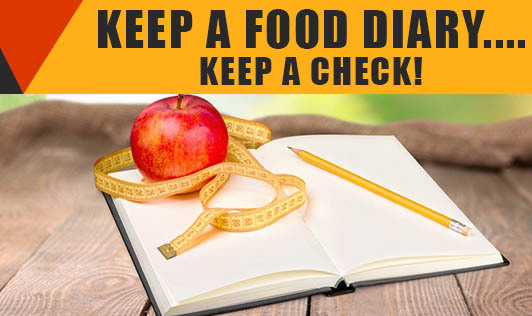 Keeping a food diary will eventually make you think twice before you munch on foods unnecessarily. It gives you a clear picture of your diet pattern, and so helps you to improve it when needed. It gradually helps to improve self control. It can be used by people who are on weight loss diets or who are diabetic and want to keep a check on the carbohydrate intake. Keep a food log... keep a check on the ‘extra' portions of foods! !